Easter is almost upon us yet again. In the Christian calender it is the time of year for sorrow, love and celebration. 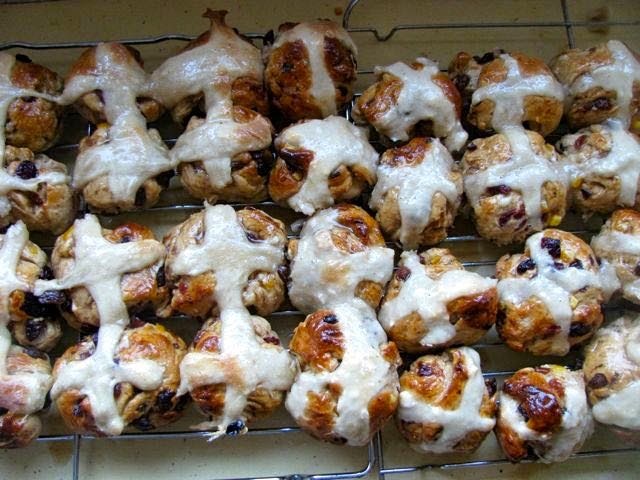 However this is a food blog so I bring you hot cross buns, chocolate and cuteness. 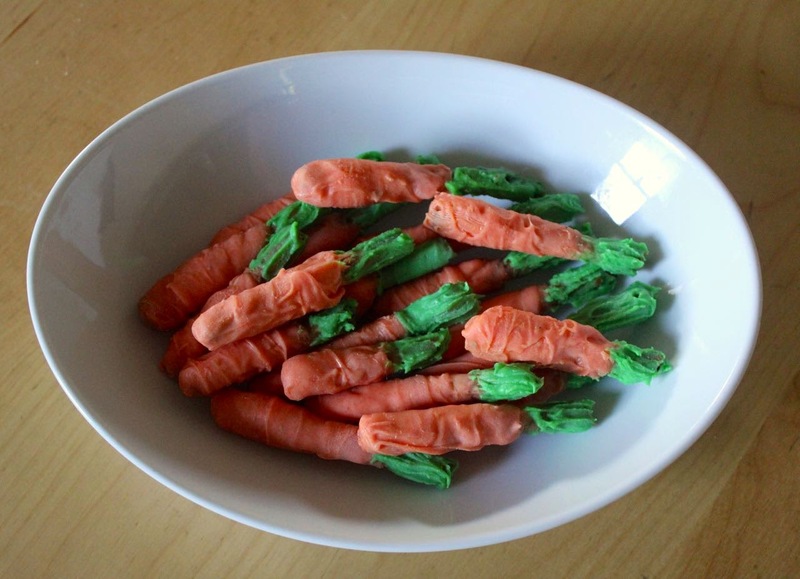 A lot of Easter food is sweet. So much sugar! 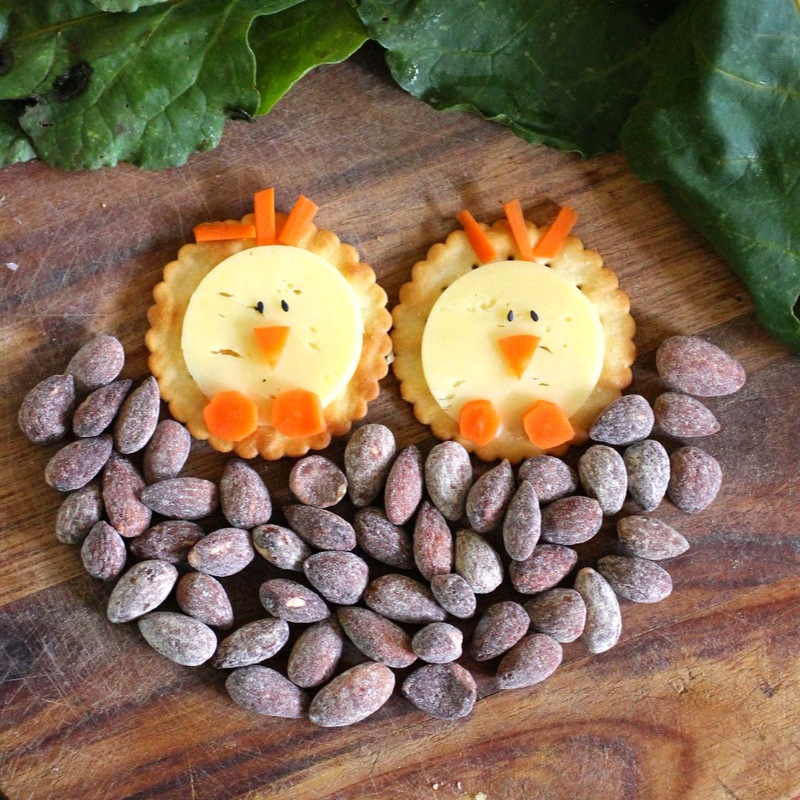 For a savoury alternative, these crackers and cheese chicks are a cute snack. And then there is an Easter egg pizza for a savoury dinner. But you can't avoid the sweet foods. 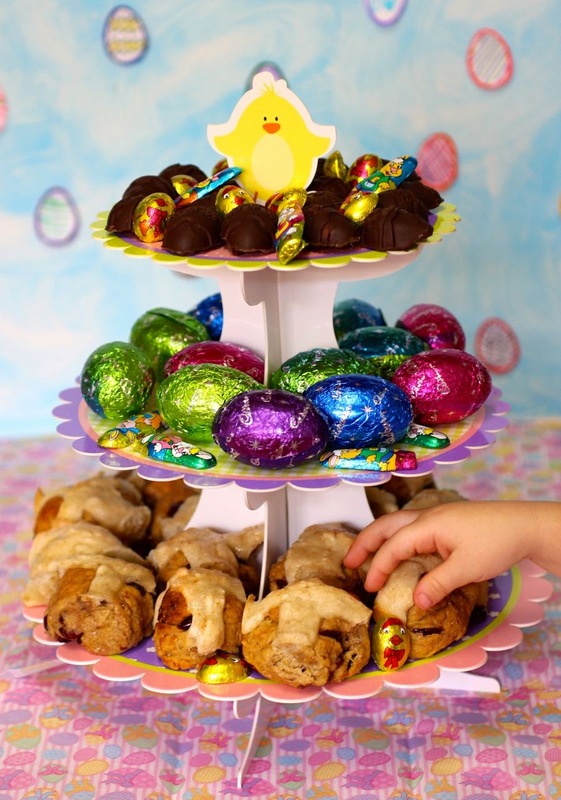 These Easter egg nests are an easy sweet treat to make with kids. A couple of years ago I found some Easter egg chocolate moulds. 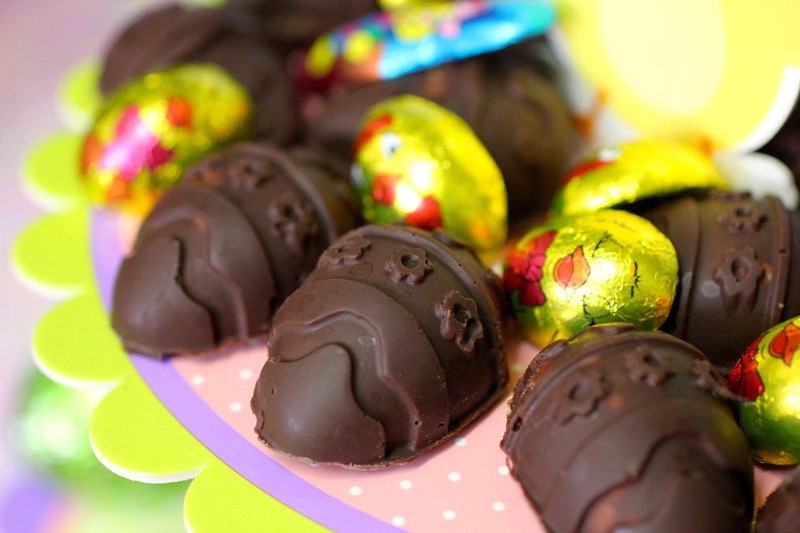 After all Easter is a time for gift giving and chocolate so why not make your own chocolate gifts. I have dabbled in making fillings for chocolates. Here are the chocolates I have made (all gluten free and vegan). 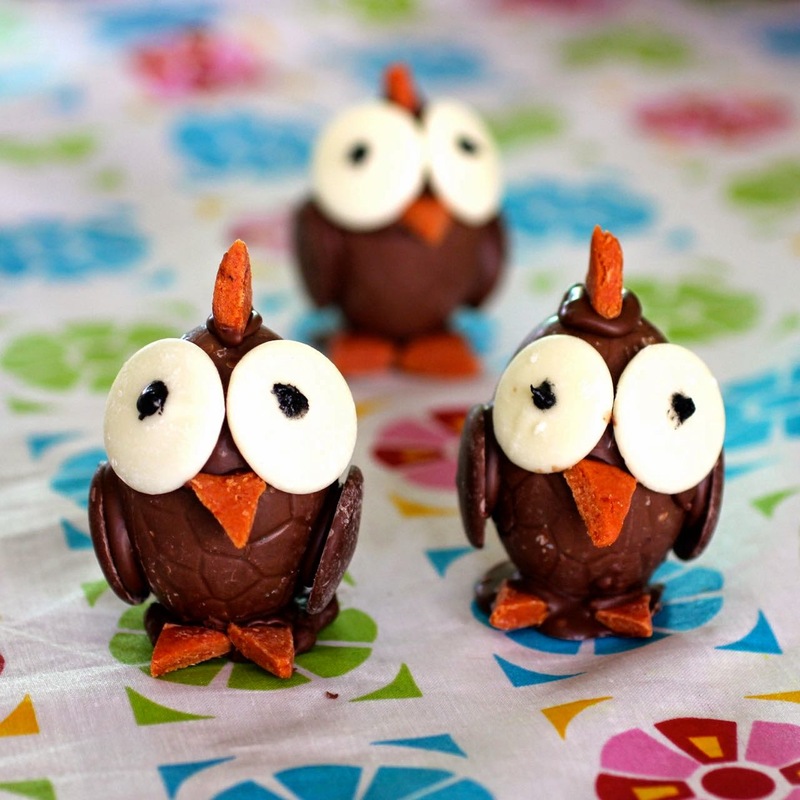 If you find filling in chocolates is too much work, a quick and fun alternative is to make these Easter egg chicks. 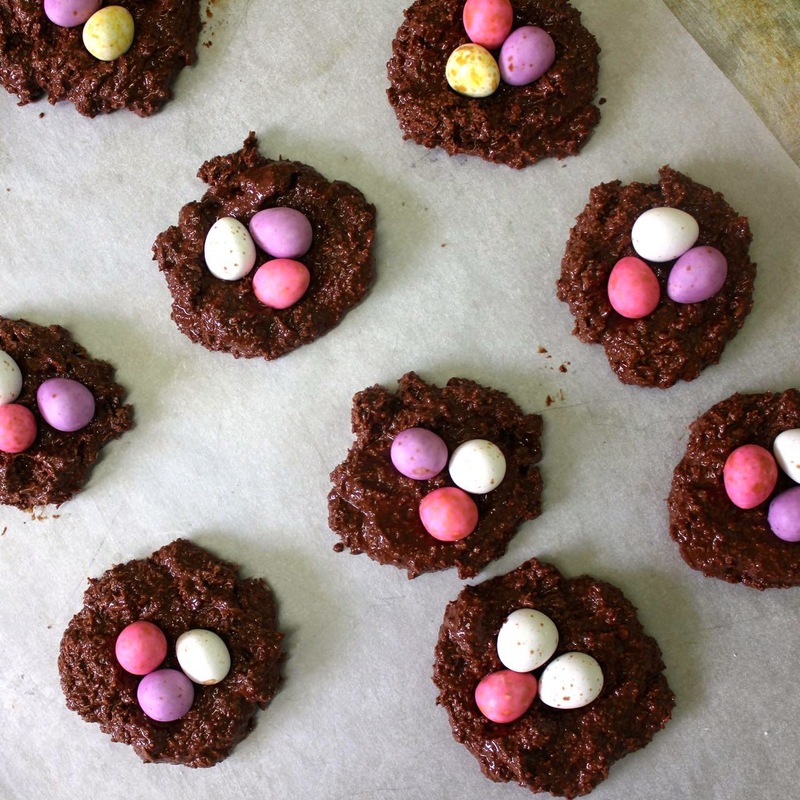 with Creme Eggs They make great gifts. 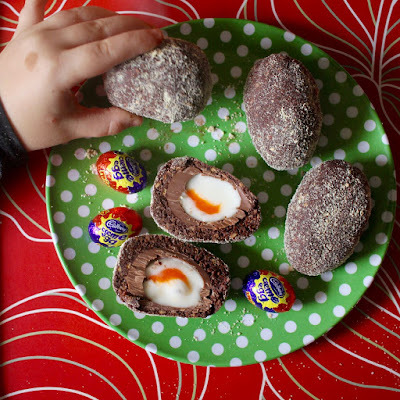 Or you can have fun and really add even more sweetness to Creme Eggs by making them into Easter Scotch Eggs. 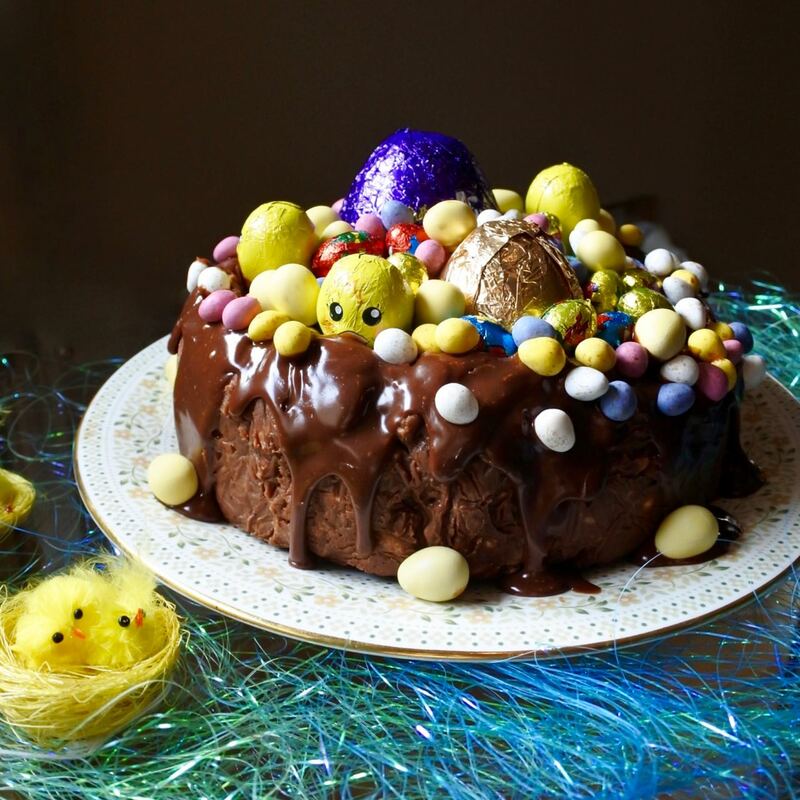 Easter Sunday lunch is the time for showstopper desserts. With chocolate of course. 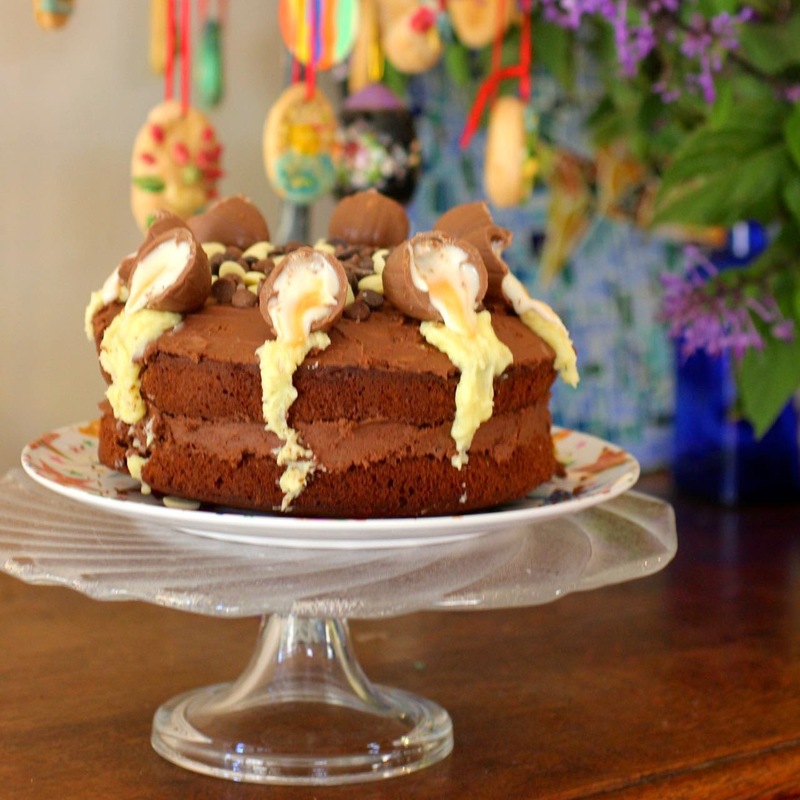 This Creme Egg Chocolate Drizzle Cake ticks all the boxes. 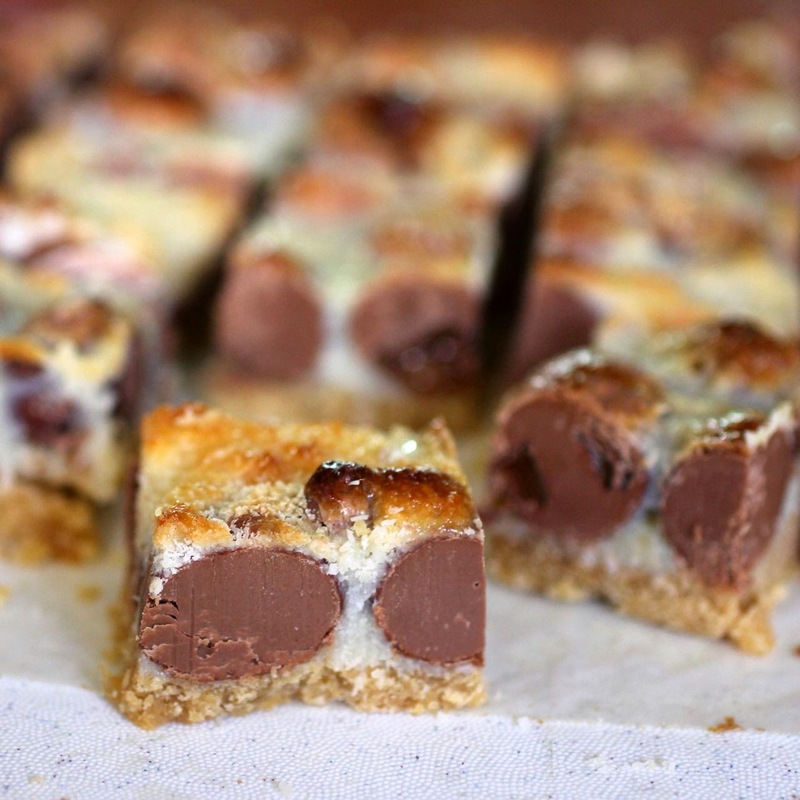 An easier cake to make is this no bake Easter Caramel and Malteser Fridge Cake. I was able to make it in a holiday house with minimal equipment and with the Easter eggs in the middle it is bound to impress. Then there are the leftover Easter eggs after all the celebrations are over. If you want to make them even more decadent then I could recommend this delicious Leftover Easter Egg Slice. 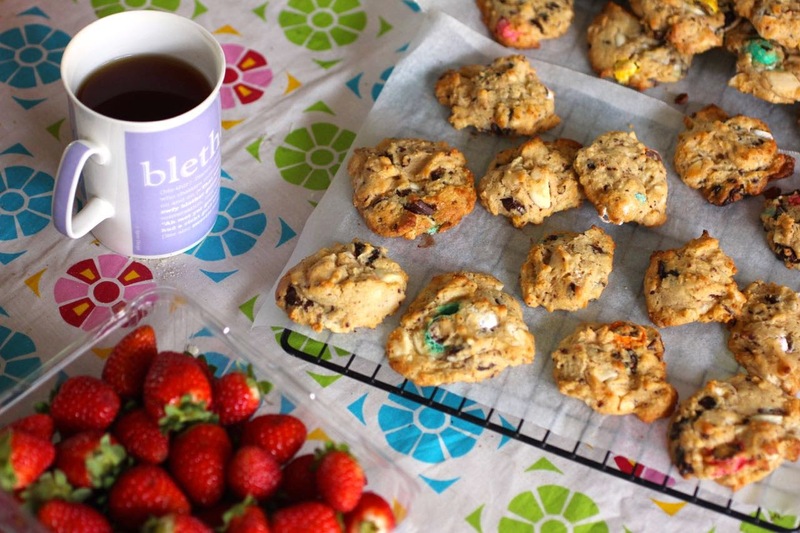 Or you can put your leftover Easter eggs into these dulce de leche choc chip cookies. 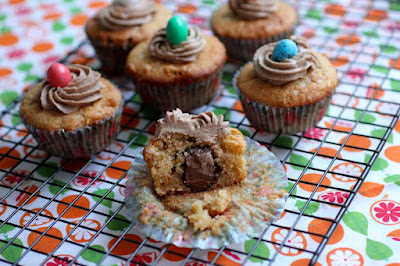 Then you can hide your Easter eggs and display them too in these Marzipan Easter egg cupcakes. 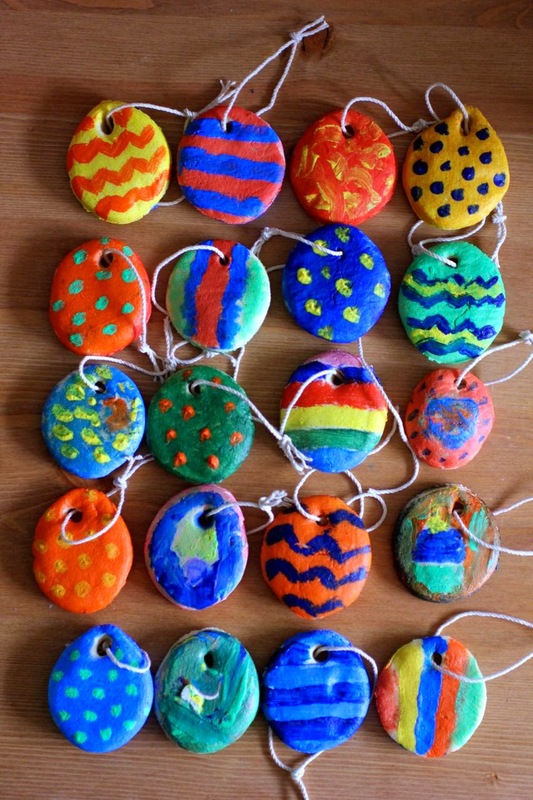 And if you want some cute decorations or gifts that are non-edible, these Salt dough easter eggs are fun to make. 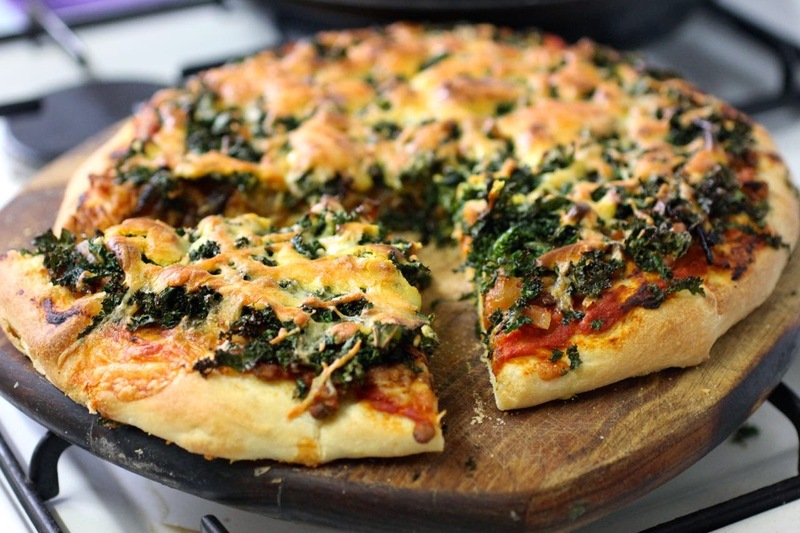 A quick post because I wanted to share a great kale pizza I made last night. No recipe. Just some ideas and a bit of fun with the family. We had pizza last night when Sylvia had a friend visit. They ate plain old cheese and tomato pizza. E and I had a magnificent substantial kale pizza. It used my sourdough pizza base, and was piled with some tomato sauce, leftover lentil and quinoa stew, fried onions, fried kale, vegveeta vegan cheese sauce, and a pizza cheese (which is optional). Making great pizza and tidying the house made me feel like a domestic goddess. 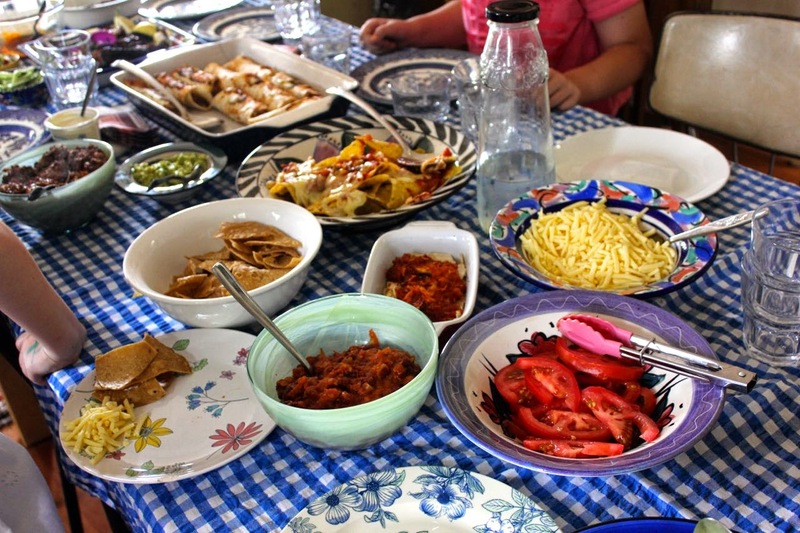 Today we had a mexican birthday lunch for my brother in Geelong. He was at a gig in Melbourne and missed it. The family enjoyed some hearty tacos, nachos and enchiladas in his honour. Fortunately he got to my parents' place in time for dessert. 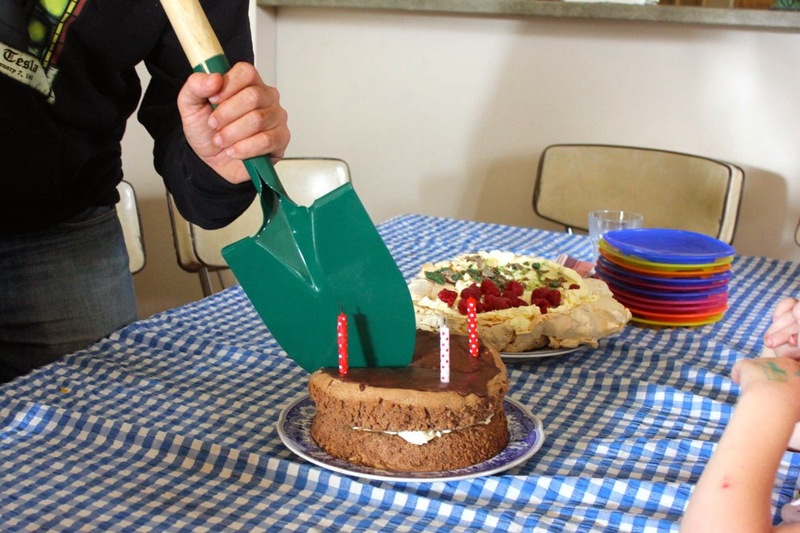 We gave him a shovel for his birthday and he dug into the chocolate cake. Mum also made a pavolva. I wasn't organised enough to bake for the lunch. Sylvia and I managed to get along to the Coburg Farmers Market before her morning gymnastics lesson. 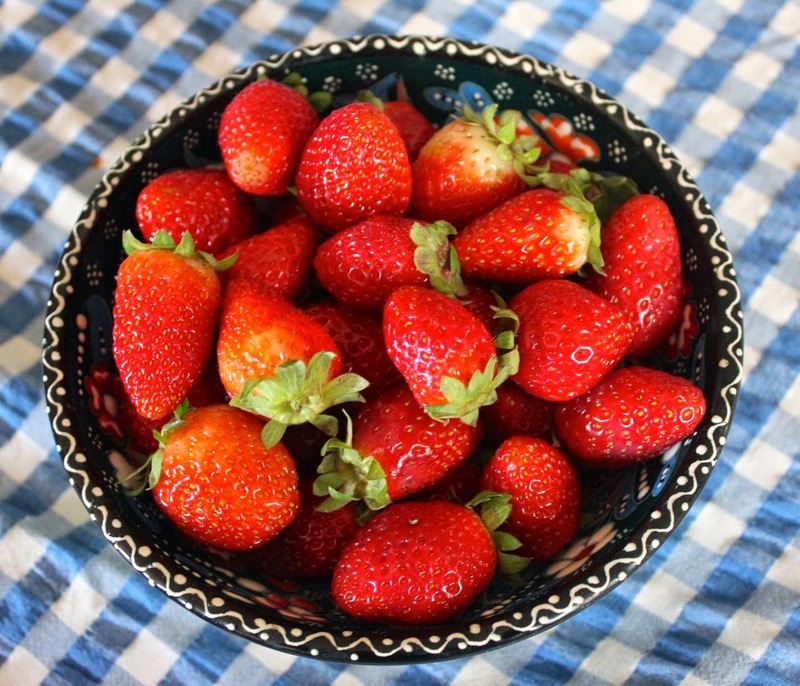 So my contribution was a packet of crispy tortilla chips and these wonderful strawberries. A nice snack while my nieces organised a talent quest. We also bought 3kg of apples at the market. We also bought bagels at the farmers market. That meant dinner was sorted when E and Sylvia and I got home. 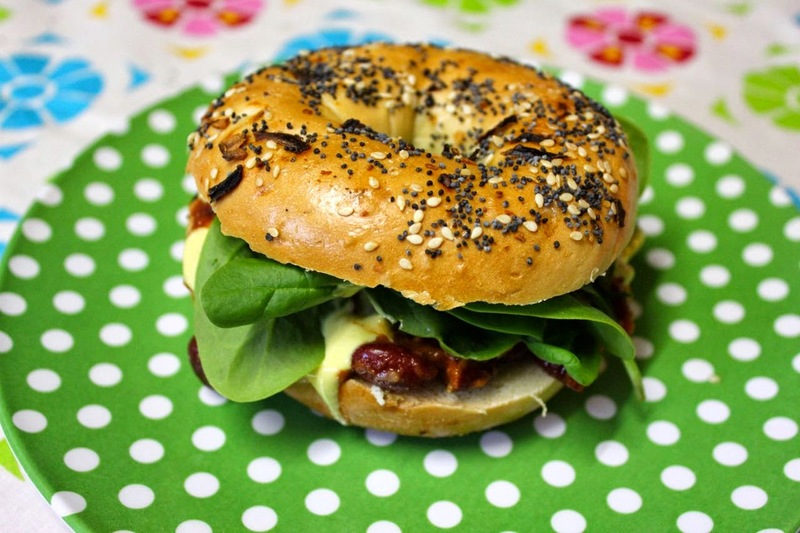 I had a deliciously messy bagel filled with leftover chilli non carne, vegan cheese sauce and spinach. Eaten while we watched The Goodies DVD. A fun start to the school holidays. It promises to be filled with Easter, playdates, Katie Perry, apples, Sponge Bob Square Pants, cleaning, movies and perhaps some silly walks. I was at a market recently and tempted by the expensive sourdough loaves. I had to remind myself that I had a fresh loaf of sourdough bread at home that had come out of the oven only a hour or so beforehand. Thanks to the lovely Celia of Fig Jam and Lime Cordial, it was ridiculously easy to make but even easier to eat. 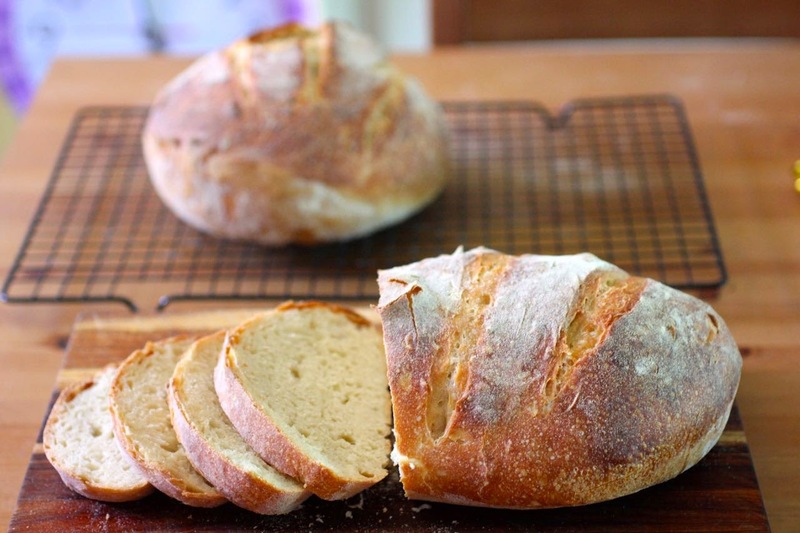 It seems crazy that a bread which has very little kneading is so so so good. Yet you can see in the photos that it has a chewy golden crust and an open tender crumb. I send Sylvia to school with sandwiches made of the bread. We eat it on lazy weekends at home. I have even given some of my sourdough starter and Celia's recipe to two of the mothers at school who hadn't baked sourdough bread before. These friends have had great success with it. It is lovely to have other sourdough bakers to chat to in the playground. And it demonstrates that it works for others too. It is such a brilliant recipe. 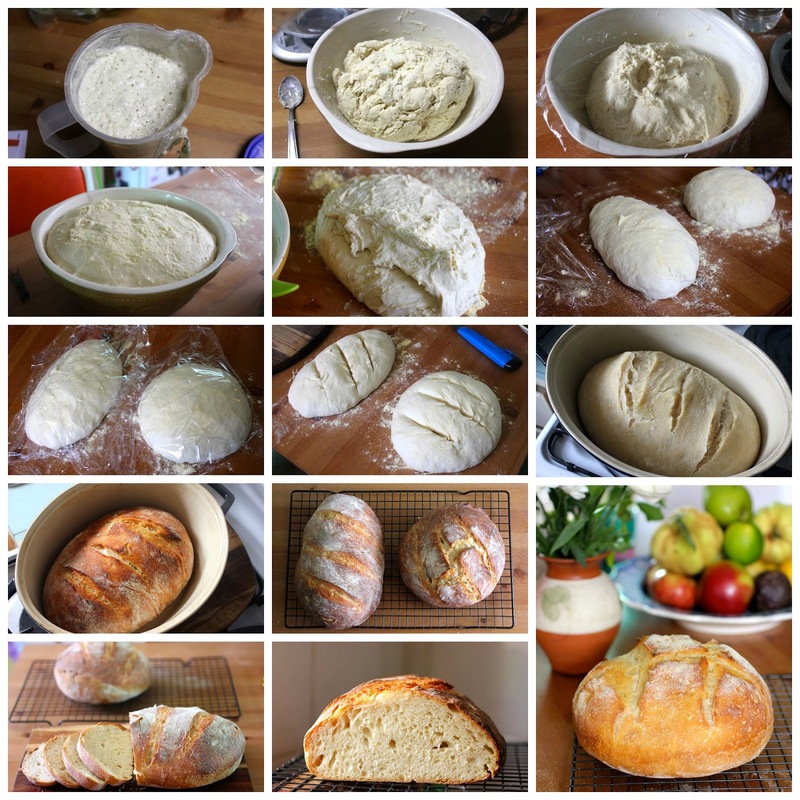 The bread I have been making is an overnight sourdough bread. I have been baking it regularly since December and still am in love with it. It requires very little kneading and very little attention. I usually prepare the dough before I go to bed and bake it in the morning but sometimes start it in the morning and bake it in the evening. 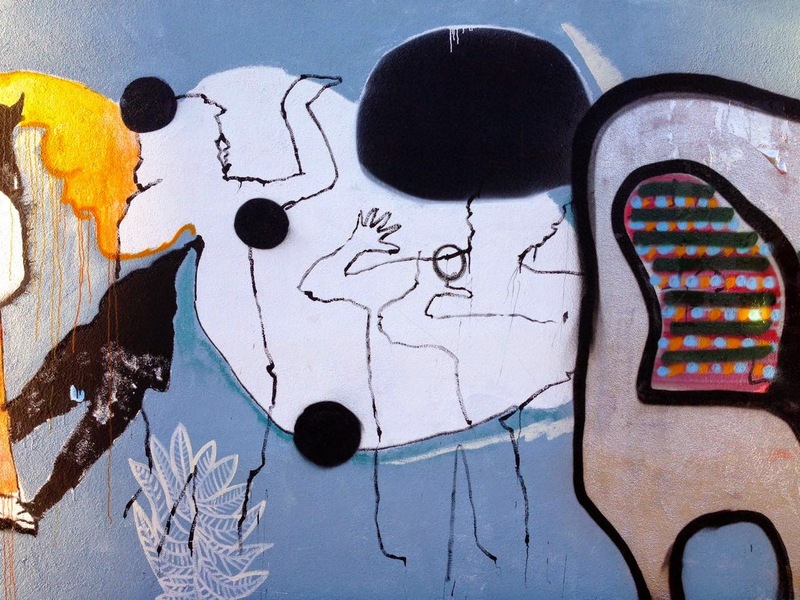 Today I am going to share some step by step photos and my notes on the process. 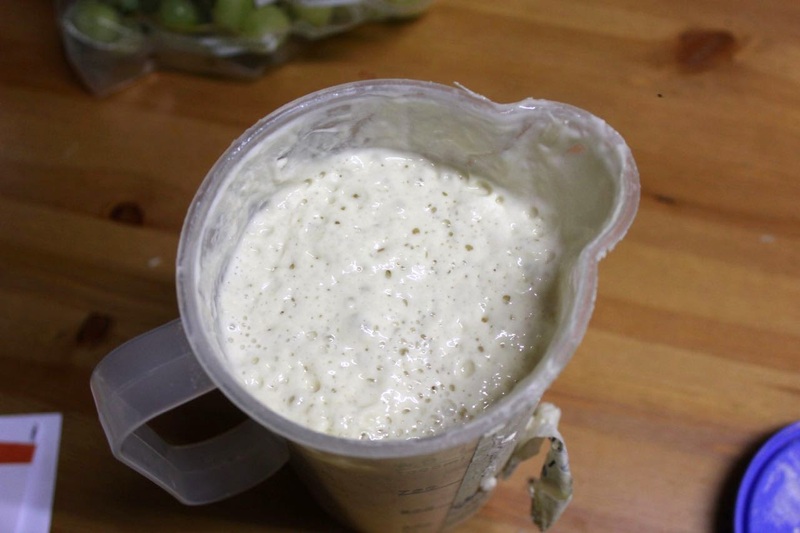 A few hours before I make the loaf, I take my sourdough starter out of the fridge and feed it so it gets nice and bubbly. NOTES: However I have had days where I have taken it from the fridge and put it straight in the mixture and it still works. My starter is 100% hydration (ie I add equal grams of flour and water) but Celia's is a slightly different hydration because she uses cup measures to feed her starter. NOTES: I usually mix the starter, water and salt first and then add the flour but sometimes I do it all together. Celia suggested using your hands. Some days I just use a spoon and some days I dig my hands in as well. Cover with clingwrap and rest for 30 minutes. Knead in the bowl for about 1 minute. 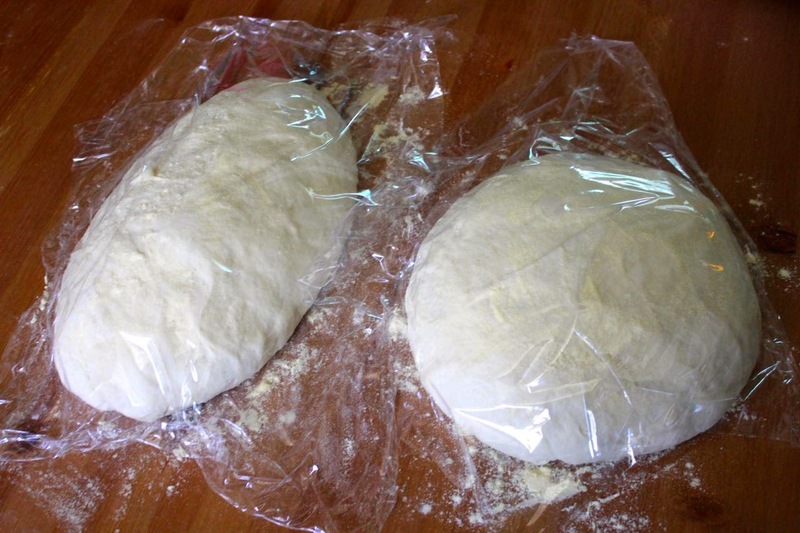 Cover with clingwrap and leave at room temperature for 8 to 12 hours. NOTES: I sometimes put a little flour on my hands if the dough is sticky. On a couple of occasions I halved the dough to let it rise as two balls but this is too fussy. However I did discover that the dough kneads smoother and easier if the bowl is cleaned and oiled. But again it is not something I really want to do late at night or first thing in the morning. I usually grease the clingwrap in case it rises enough to stick to it. Or sometimes I have dusted it with maize flour. 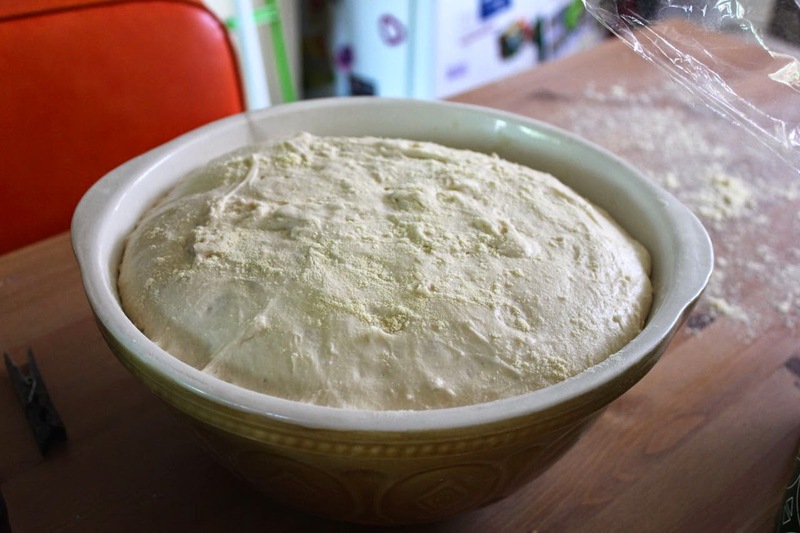 In the morning or evening the dough should be risen. 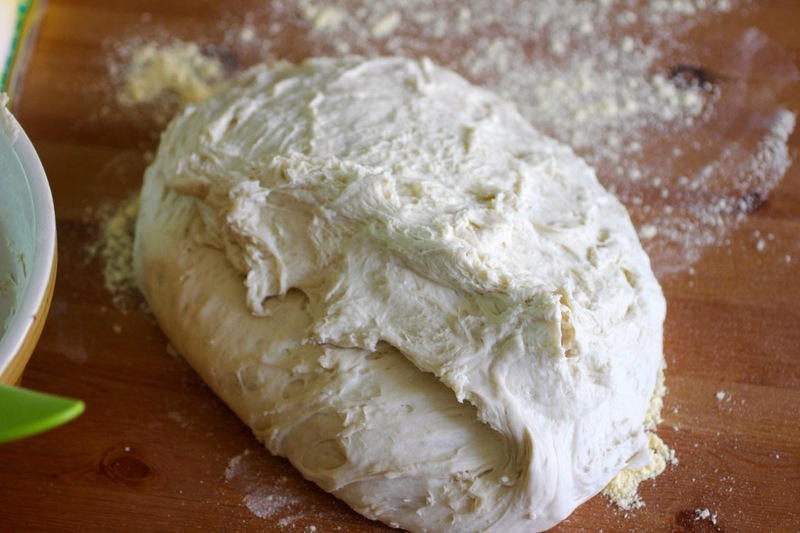 Scrape dough out onto a lightly floured board. 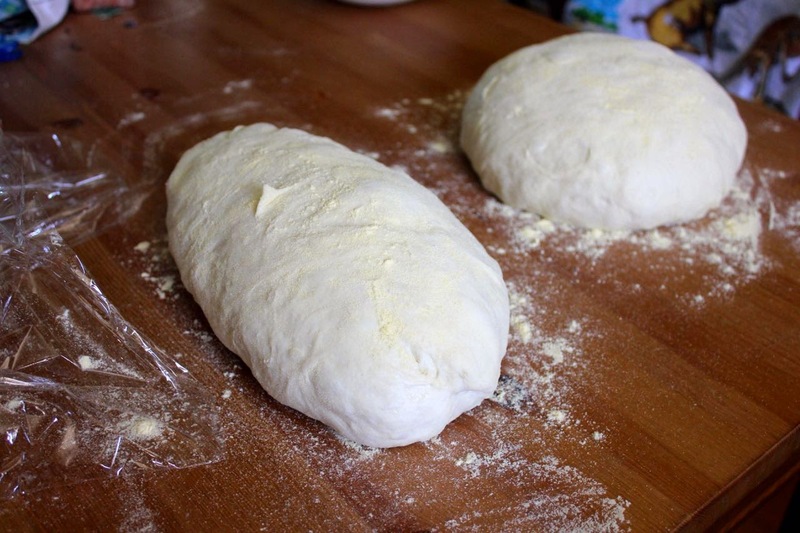 Very gently without punching the air out, fold the dough in three. NOTES: I have a silicon spatula that I use to scrape the dough out of the bowl. 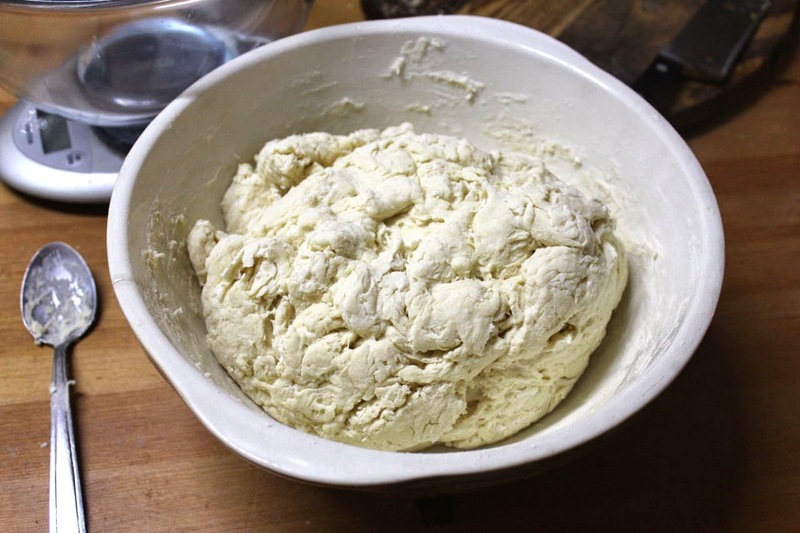 The dough should not be punched down at this stage. I use maize flour - a very fine polenta or cornmeal that has been in my flour collection for ages and finally I am using it. Celia uses a fine semolina but warns that wheat flour makes it stick too much. Hmmm... I wonder if I forgot to fold the dough in three last time. 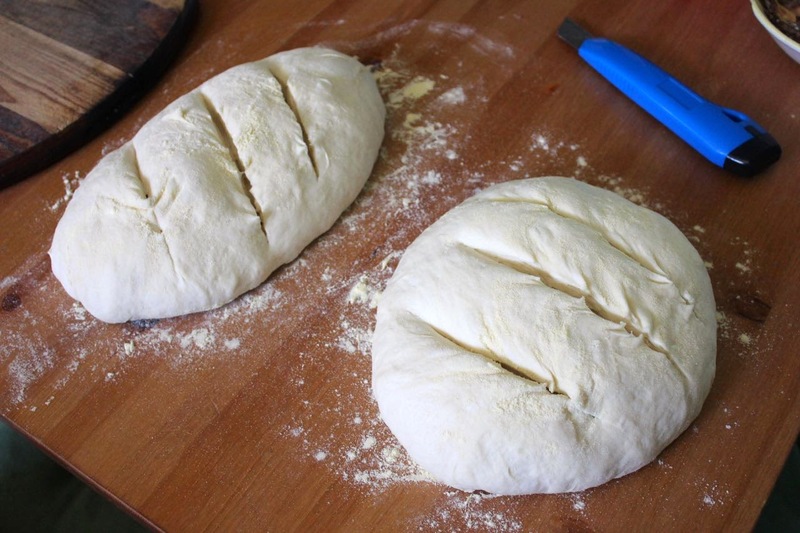 Cut the dough in half and shape into two loaves. Place on a floured surface and cover with the lightly greased clingwrap. Set aside to rise for 30 minutes. NOTES: I used to use a knife to cut the dough but it tore at the dough. Celia has dough scrapers to cut her dough but I don't have any. So I started to use a firm plastic eggflip/spatula that is a bit like a dough scraper. It cuts more cleanly. 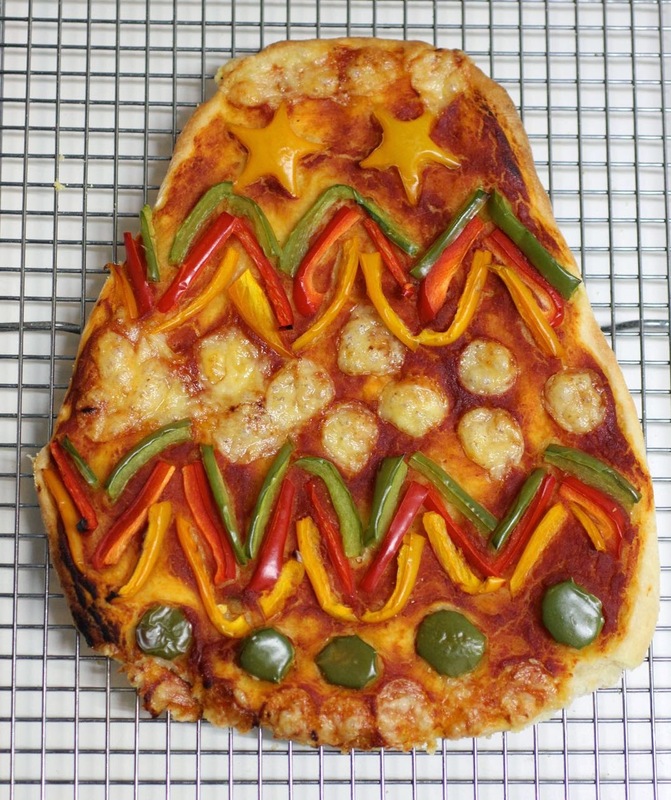 I am still learning to shape the dough but find online advice useful such as Celia's advice. What I have learnt is important (especially for slashing) is to have the outside of the dough really tight or tense so you need to pull it tight towards the bottom. I have sometimes sprinkled flour over the top of the dough so I don't need to grease the clingwrap. 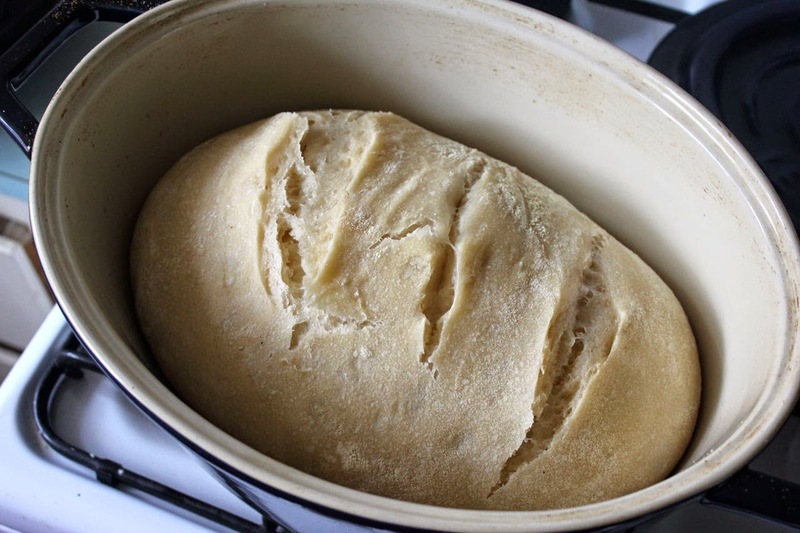 While the loaves rise, preheat oven to 240 C, with casserole dishes heating if you are using them. 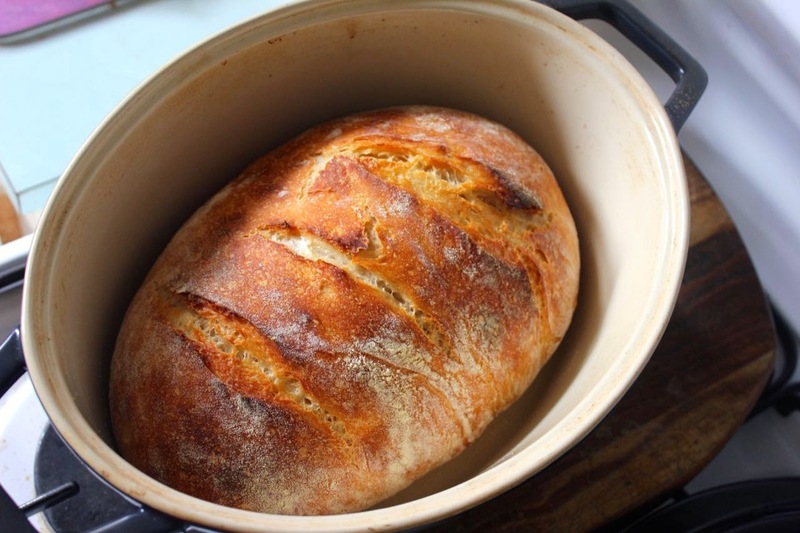 NOTES: Celia bakes her loaves in enamel roasters. I have a cheap oval ceramic casserole dish and an old round ceramic casserole dish. Neither are ideal but they do the job. I prefer oval to round loaves. 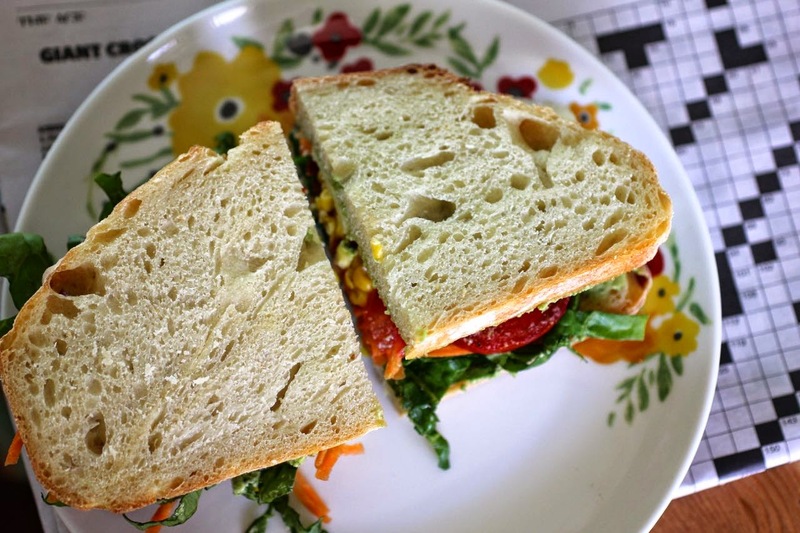 Oval loaves produce more manageable slices, though it is easier to shape the round loaves. However my main problem with the round casserole dish is that it doesn't have handles and is hard to get out of the oven when it is quite snug against the oval one. I keep meaning to find another dish but it is not that high on my list of priorities. UPDATE I now have enamel roasters. 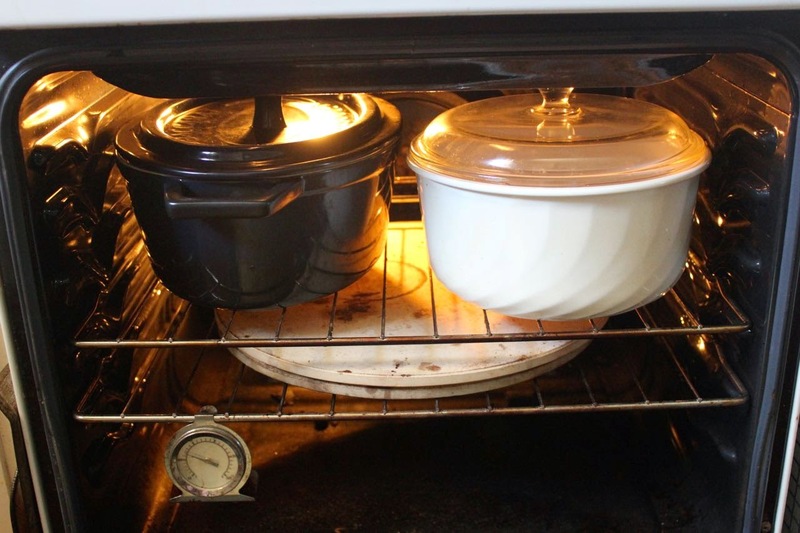 It is not necessary to use the casserole dishes - bread can also be baked on an oven tray or in a tin, neither of which needs to be preheated when you preheat the oven. After half an hour the loaves will have risen slightly. Slash the loaves and put in the heated casserole dishes with lids on (or on a tray or in a tin). NOTES: I haven't been great at slashing loaves. Lately I have been doing better. I am not sure if it is the recipe or my purchase of a stanley knife to slash. The stanley knife is constantly getting rusty and I need to scrub it so it is not ideal. Sharpening my knives just before slashing also helps. Most of all, I find you need a firm confident hand for slashing. UPDATE on the slashing - I now am back to using a knife but a confident hand. 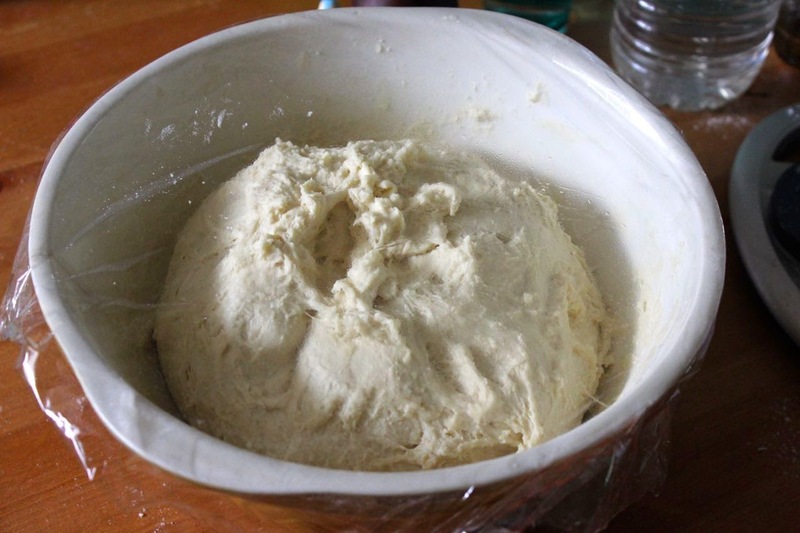 It also makes it easier to slash if the dough has good tension so it springs back. Then I find that transferring the loaves into the heated casserole dishes and keep the slash open because even my gentle handling seems to make the dough a little misshapen. However this usually seems to sort itself out in the oven even if the dough lands in the dish a bit skewhiff. And yes, the casserole dishes don't need greasing. If you use a tray or tin you might need grease or baking paper. Bake for 20 minutes with lid on. Remove lid and bake another 20 minutes. Then reduce oven heat to 180 C and return to oven for another 10 minutes to make sure the crust is crispy and golden brown. Cool your loaves on a wire rack for at least an hour before slicing. NOTES: The bread keeps baking when out of the oven. If you slice in too early the texture will be claggy but if you are really impatient or hungry it is very edible. Slice up your bread and enjoy. It is best on day of baking, delicious the next day and then after that I find either freezing it or toasting it is best. 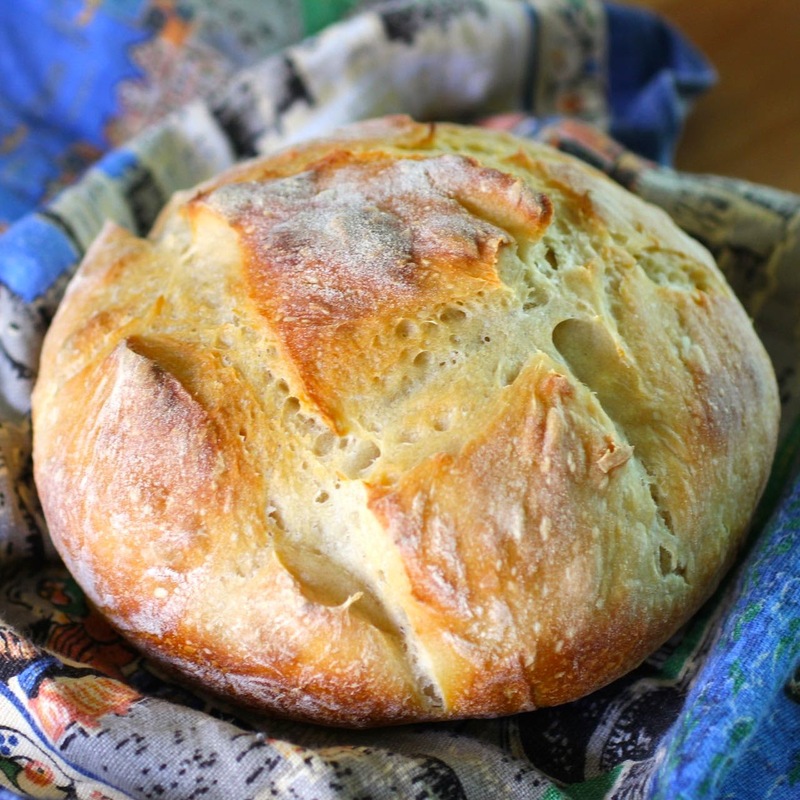 I have made this recipe with half the ingredients and it works well but I figure we will always go through the bread even if some needs to go into the freezer so now I always make two loaves. I have even been known to give the second loaf to a friend. If you don't have scales you can convert to cups - one friend doesn't have scales and is delighted with her bread. I recently tried adding a tablespoon or two of chia seeds and about 1/4 of the flour being wholemeal. This worked well. 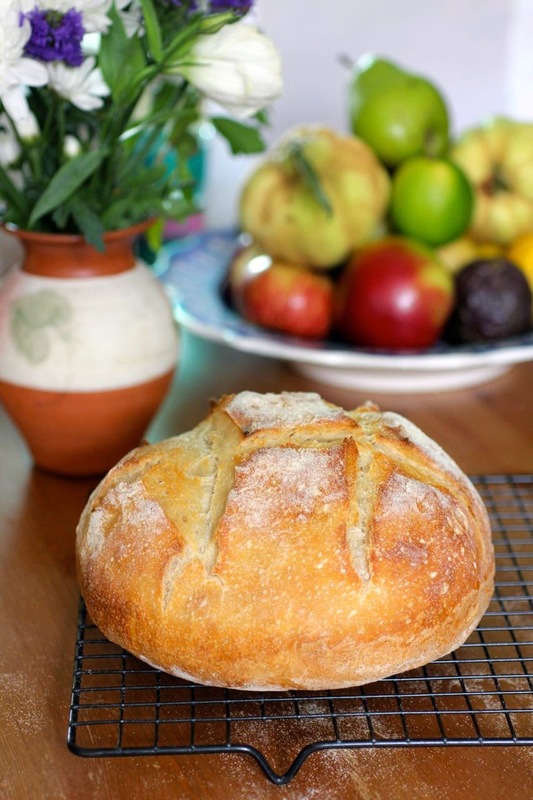 I also loved a loaf I made with a combo of rye, spelt and wheat flours. 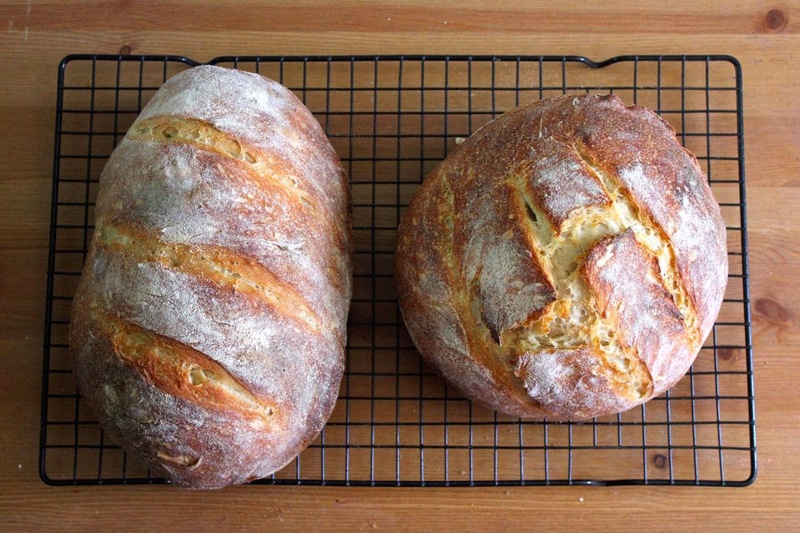 The time the bread takes to rise is quite different on chilly winter nights than in summer. On some winter mornings when I bread hasn't risen well overnight I put it in a warm place like near to the heater to help it rise. And for those who like such things, I have made an image of all the step by step photos. I can't recommend this bread highly enough. 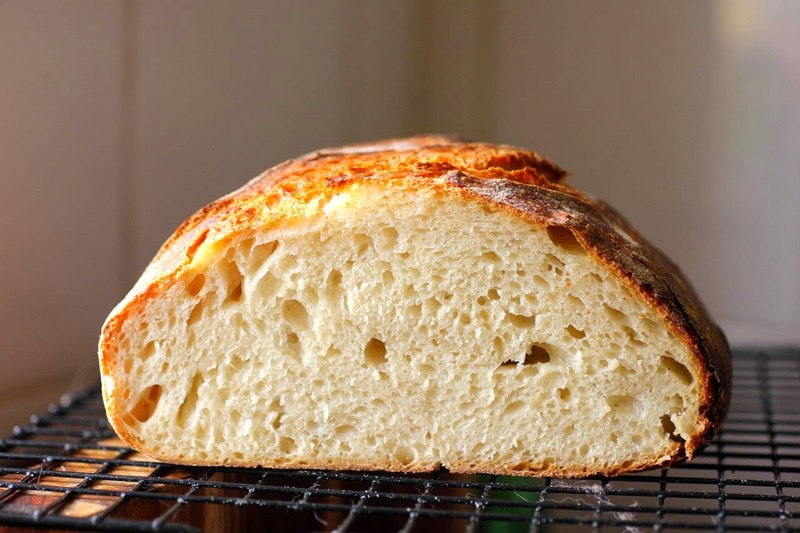 In fact I suspect I might not have been keeping my sourdough starter alive if I didn't have this easy recipe to make it a doddle to bake sourdough bread regularly. I am sending this sourdough bread to Susan of Wild Yeast for YeastSpotting. And I am sending it to Jacqueline at Tinned Tomatoes for Bookmarked Recipes. 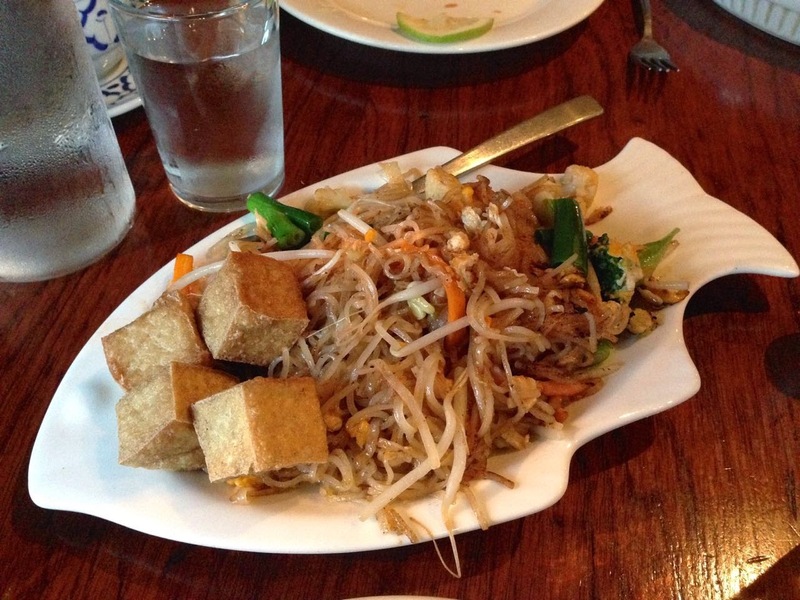 There was a time when I would go to Thai restaurants every now and again. It is long passed. However when I had a particularly wet Pad Thai at a market recently it was so wrong that I longed for a good Pad Thai. 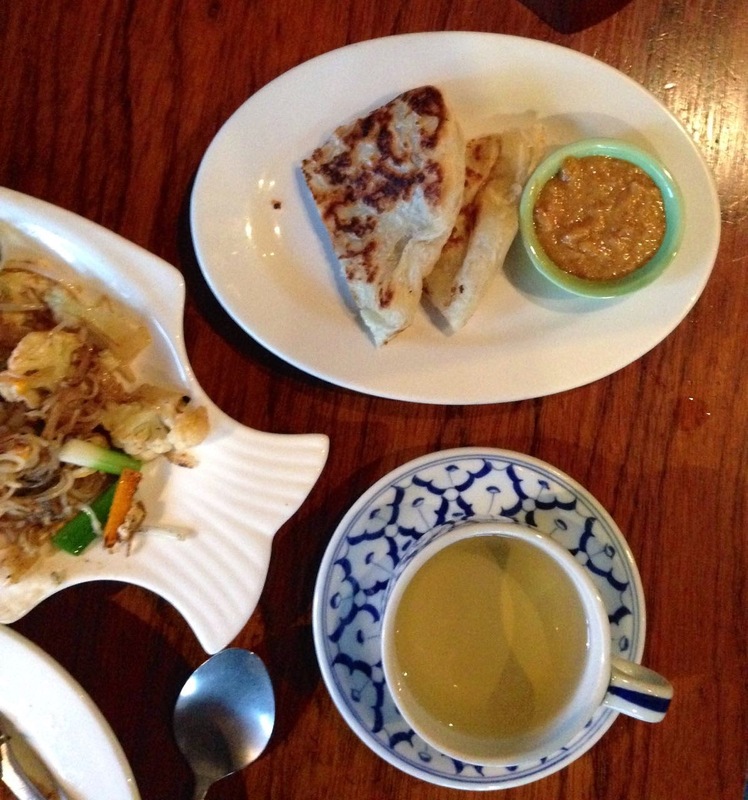 So when Sylvia went to a sleepover birthday party E and I had the rare treat of a dinner date at Thai Nee. 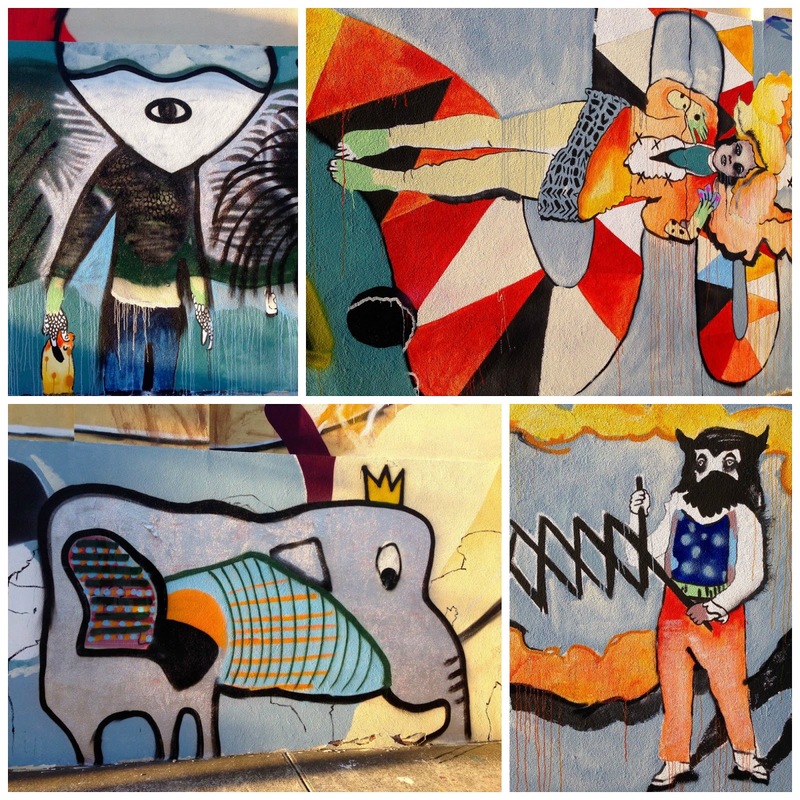 We ate well, we were treated well, and we admired the street art outside. 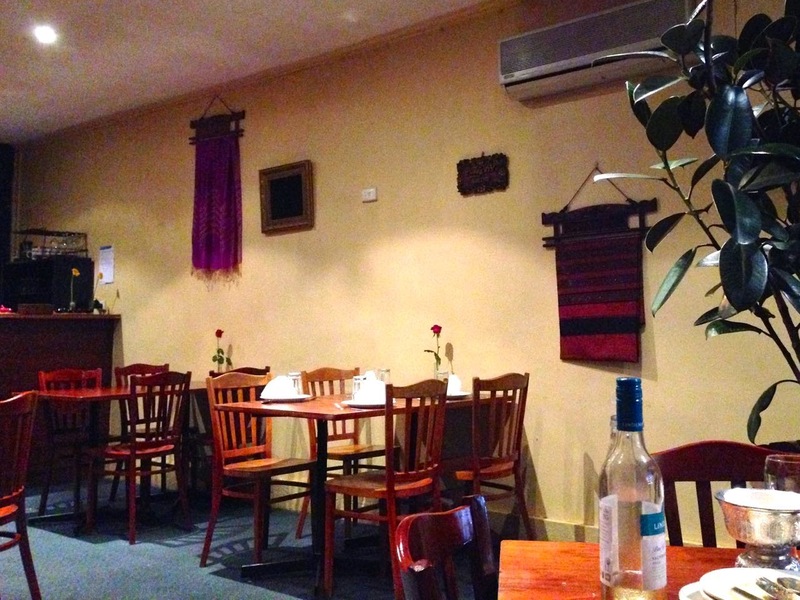 I chose Thai Nee in East Brunswick because we had been there with friends years ago. It was so long ago I barely remember the meal but I know I enjoyed it. I was pretty sure that it was vegetarian-friendly because the friends who chose it were also vegetarian. 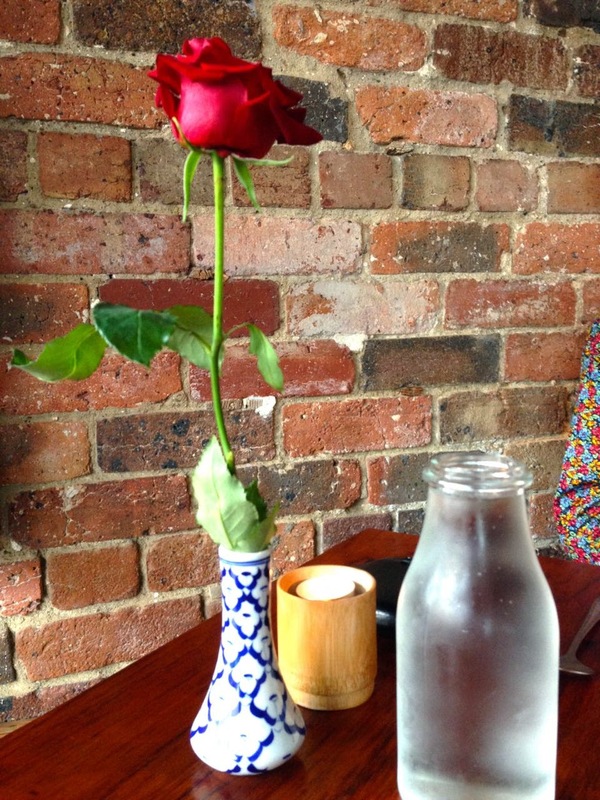 We were pleased when we arrived to find a rose and a candle at the table. The restaurant wasn't that big, though not quite tiny. It was fairly busy with not many empty seats. (The photo below was taken later in the evening after some tables emptied.) When I asked the waiters about dietary issues they were very helpful in telling me what was and wasn't vegetarian on the menu. While I didn't ask directly I got the impression that they were vegan-friendly as well. And while I am reminiscing, do you remember a time when vegetarian meals were cheaper than meat meals. I always thought this was because meat was more expensive but these days I have no idea of the price of meat so I don't know if it has changed. 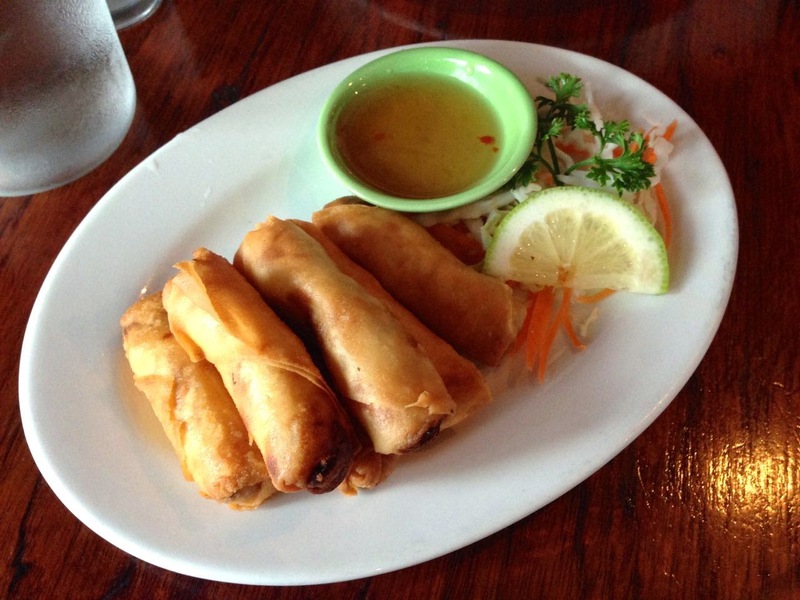 We started with vegetarian spring rolls. They were crisp and hot and made us happy while we waited for our main course. E then had a chicken curry with rice which he loved. Sadly we didn't order enough rice to have it in one of the fancy silver bowls. We also had roti with our mains. (I was told that the dipping sauce had fish sauce in it so I avoided it.) It was fantastic. Really light and fluffy with crisp edges. My main course was Pad Thai. It seems a given, but there were so many other tempting meals on the menu that I swithered before ordering. Probably one of the disappointments was that the tofu was not very hot and a bit bland but I did appreciate having some tofu. So overall I really enjoyed my Pad Thai. The flat rice noodles were full of flavour in that pleasingly sticky way and there was a satisfying amount of vegetables as well the the tofu and peanuts and eggs. By the time we left it was dark and harder to see the artwork on the side of the Thai Nee building. I had taken this photo a while back. 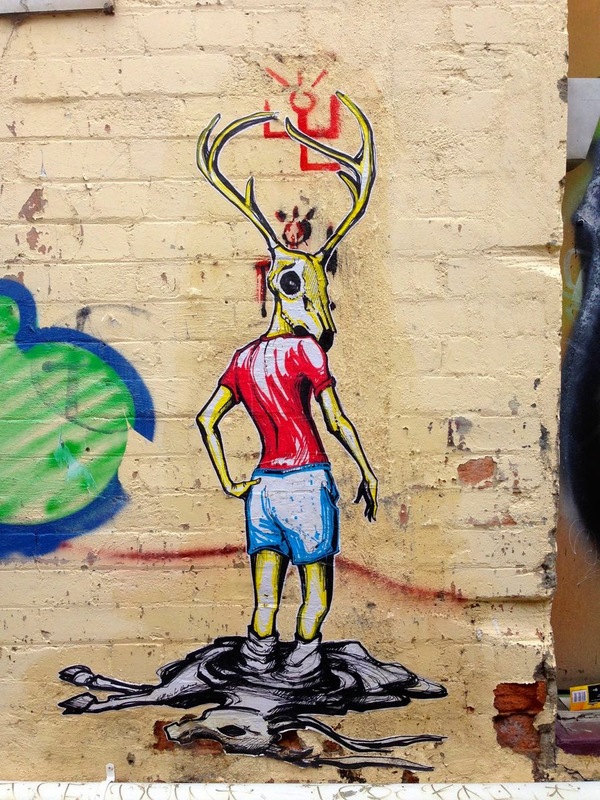 It seems a good segue into the street art in the area. 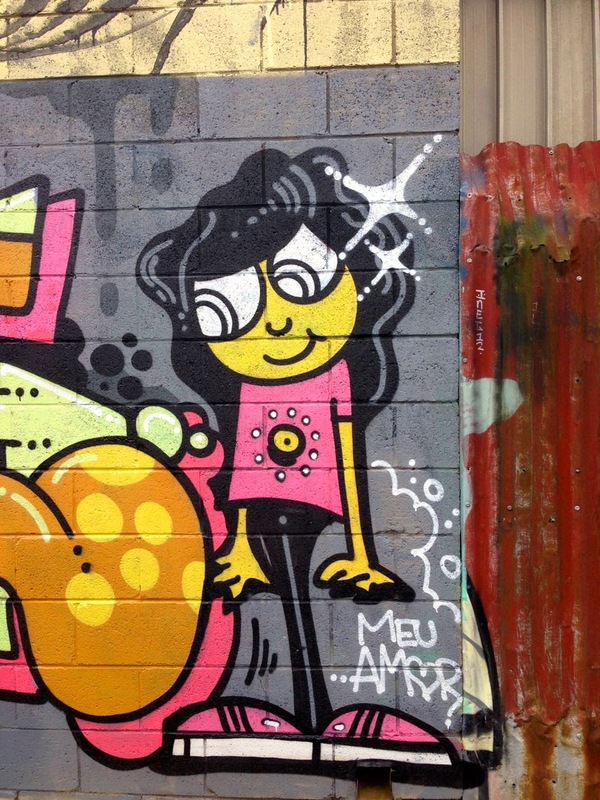 When we arrived at Thai Nee I couldn't go in without crossing the street to look at the street art on the other side of the road. It is full of interesting characters. And I was quite taken by the little house on fire. I wonder why the person is standing outside. 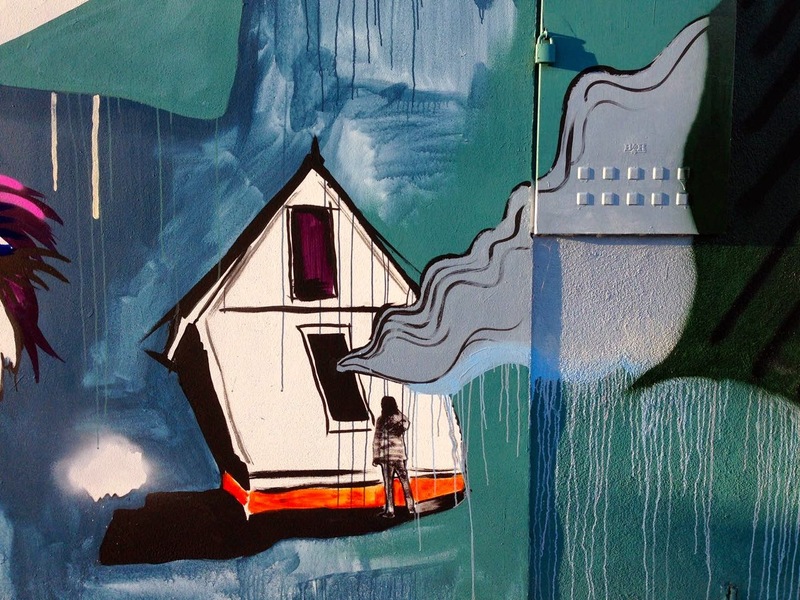 Are they watching their own house burn, having escaped, or are they just a passerby? 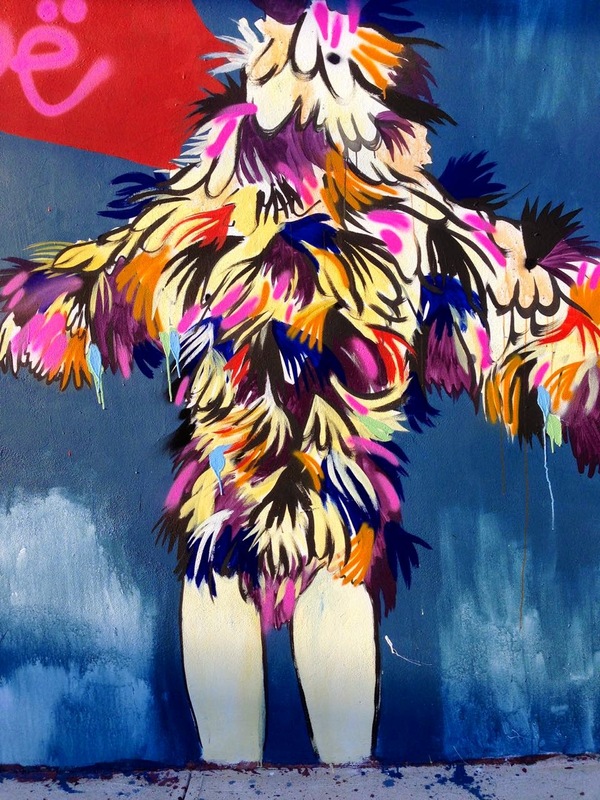 Then we noticed the some of the artwork seemed incomplete. 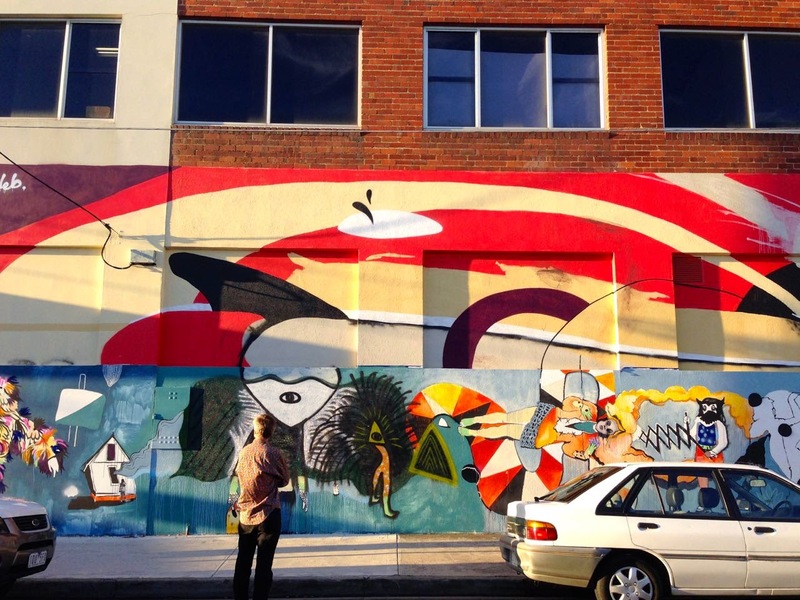 I really need to go back and see if more has been added to the mural since our visit. Isn't this little girl cute? 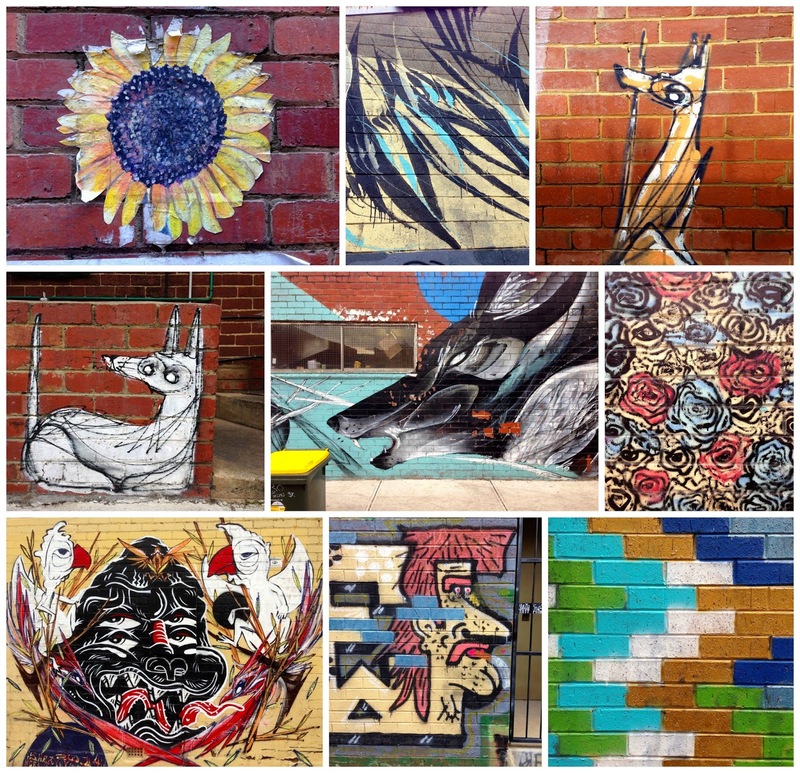 More street art, some of it in the lanes just off Lygon Street. 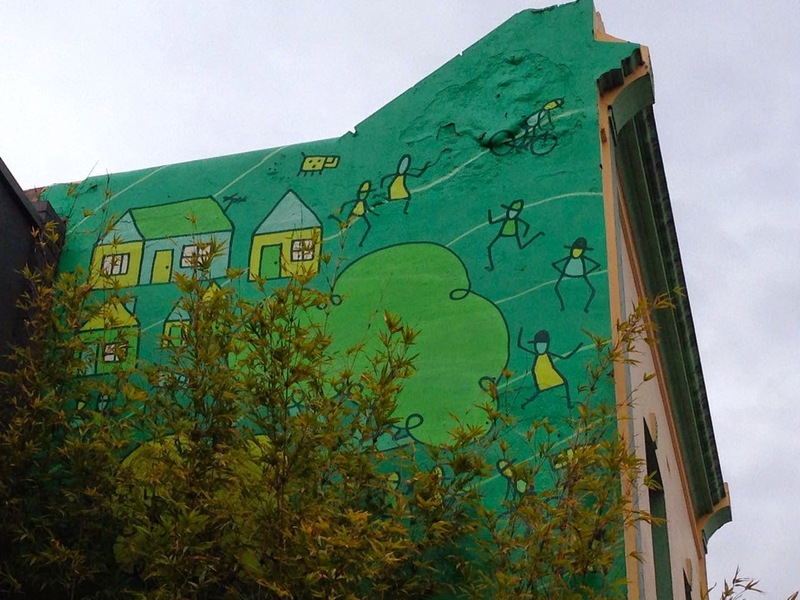 And I end with one of my favourite pictures that I see when we drive up and down Lygon Street. 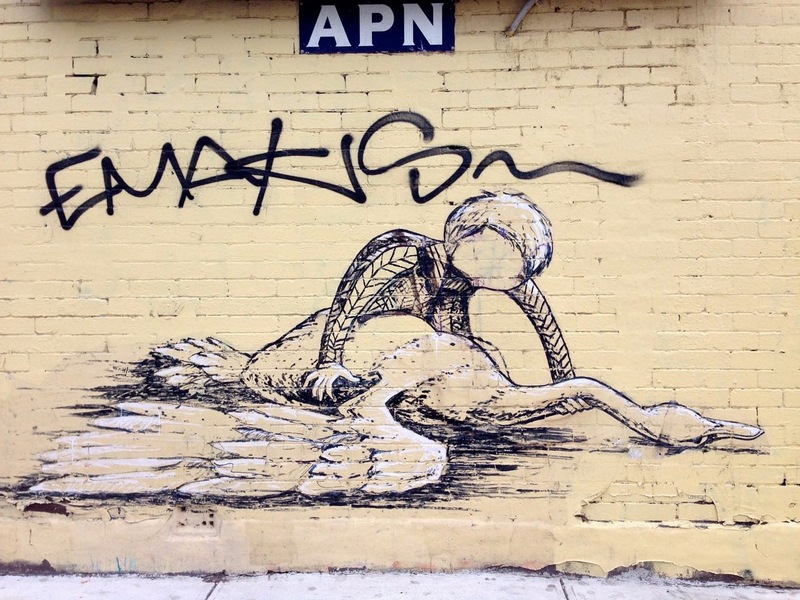 It makes me think of Swan Lake and the poignant moment when the swan is dying.